½ cup contains 25 calories and less than 1 g of dietary fiber. Cantaloupes are also good sources of vitamins A and B9 as well as minerals like potassium. Cantaloupes contain vitamin A which is useful for maintaining healthy skin. Cantaloupes contain the antioxidant beta-carotene which can lower the risk of developing cataracts. 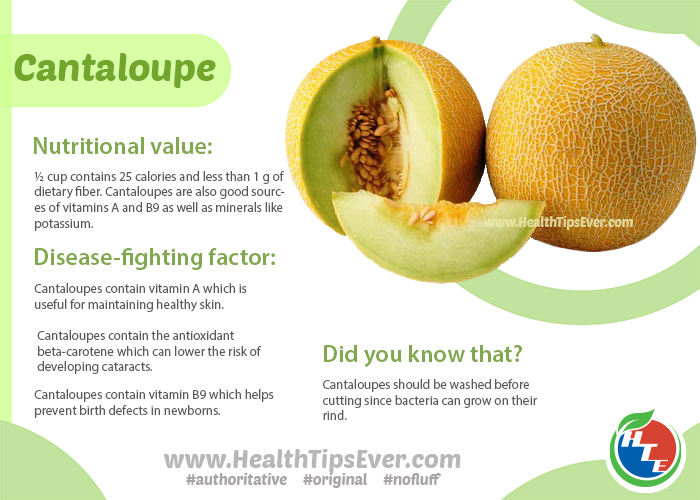 Cantaloupes contain vitamin B9 which helps prevent birth defects in newborns. Cantaloupes should be washed before cutting since bacteria can grow on their rind.